PATRIOTIC Front (PF) youths perpetrating violence will be flushed out because they do not represent the aspirations of President Edgar Lungu to maintain a peaceful Zambia, PF information and publicity deputy chairperson for Southern Province Paul Silungwe has warned. Mr. Silungwe said President Lungu had made it clear that he wanted a free, fair and peaceful election devoid of violence, saying those who claimed to be his followers would be betraying him if they resorted to fighting their opponents when they felt provoked. He said there was need for the youths, who were victims of political violence, to refrain from activities that dented the image of the ruling party by becoming examples of peace to opposition political parties and warned that those who were in the habit of going against the party guidelines would have themselves to blame if found wanting. He said the PF would only win the elections through the massive development that the country had received since it came into power and that there was no need of engaging in acts of violence because development was enough to convince the people to give it a fresh mandate. “As the PF youths in Southern Province, we will always strive to maintain peace in line with the President’s directive and would like to encourage our members to desist from engaging in violent activities when faced with conflicting ideas because democracy is about respecting other peoples’ views even when you don’t agree with them. “Our duty should be to explain to the people the development that the PF has managed to deliver to the people in the short period it has been in power and what it is yet to do if people give us a fresh mandate which I am sure they will do because we are the strongest party right now,” Mr. Silungwe said. He urged all political party candidates who would participate in this year’s election to base their campaign on what they would do for Zambians and not engaging in character assassination as that was a source of conflict. He said that as long as the candidates stuck to their campaign promises, Zambia would manage to have free and fair elections which were violence incident-free, adding that youths should reject politicians who were in the habit of using them to achieve their selfish motives. “Most of the time we have seen politicians taking advantage of the youths by using them to achieve their objective and dumping them after achieving that. When we talk about violence, it is the youths who are victims because politicians take advantage of their vulnerability to instigate violence with the hope that they would win the elections. “Our message to all the youths is that they should not make themselves available to such types of politicians because they do not mean well for them. 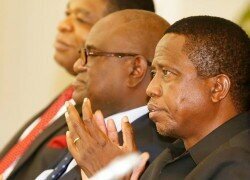 They are not interested in the welfare of the youths and Zambians in general but their own interests and so the youths should stay away and say ‘no’ to violence,” he said.